Japanese export declined while imports rose in July. Will the NIKKEI continue declining? Recent Japanese economic data were positive after the Bank of Japan June meeting. Japan’s economy resumed growing in the April-June quarter after 0.9% over year contraction in the first three months of 2018. Q2 GDP grew at 1.9% annualized rate. The biggest contributor to the GDP growth was the 0.7% increase in private consumption, which accounts for nearly 60% of Japan’s GDP. However on Wednesday Japan’s finance ministry reported a bigger than expected trade deficit in July. The trade deficit of Y231 billion ($2.08 billion) in July after Y721 billion surplus in June was mainly due to drop in car exports to the US and increase in imports of crude oil and medical supplies. The deficit was much bigger than an expected Y50 billion gap, mostly the result of 5% over year drop in Japan’s exports to the US. 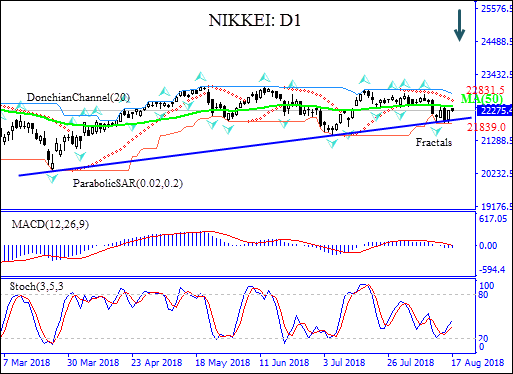 Weaker economic data are bearish for NIKKEI. On the daily timeframe the NIKKEI: D1 is below the 50-day moving average MA(50) which has leveled off. And the price is testing the support line. The MACD indicator gives a neutral signal: it is below the signal line but the gap is steady. The Stochastic oscillator is rising but has not reached the overbought zone. We believe the bearish momentum will continue after the price breaches below the lower boundary of Donchian channel at 21839.00. This level can be used as an entry point for placing a pending order to sell. The stop loss can be placed above the upper Donchian channel at 22831.50. After placing the order, the stop loss is to be moved every day to the next fractal high, following Parabolic signals. Thus, we are changing the probable profit/loss ratio to the breakeven point. If the price meets the stop loss level (22831.50) without reaching the order (21839.00), we recommend cancelling the order: the market has undergone internal changes which were not taken into account.